Taylor Swifts new album (1989) hit the stores recently, scoring record sales and closely behind that: Taylor haters. Now, I'm sure that there were those who didn't like her music before and there may have been others who like her music - then changed their mind. But the main flap I'm hearing (and it has to be prevalent to get on my useless - nay, near oblivious - radar) is that Taylor has gone pop and abandoned her country roots. I don't care. That sounded a little cold. Let me expound on the topic by saying that I don't know why anyone cares. I can't stir up true emotion for people I don't actually know; she could be the offspring of a Stepford wife for as much interaction as I have or will ever have with her personally. We don't move in the same circles, shockingly. All I will ever see if the "persona" that she, or her team of public relations professionals, want me to see. Again...it doesn't matter to me. Whether she sings country, pop or dances the hanuma wannama while eating a banana has no bearing whatsoever on how my day will roll out...or unravel. The act of purchasing Swift's recordings is now, and will forever be, optional. As a matter of fact, it doesn't affect the Taylor haters, either. So, what's their beef? If you don't like something, ignore it. It's easy to NOT buy an album...I've done it for years (talking to you, Marilyn Manson). In fact, I'll probably not buy albums I despise all day. It's hardly aerobic; no sweat. Try it. Think of a song you don't like. Now don't buy it. If I were in the market, though, you could do a lot worse that Taylor Swift (Bjork). She has talent, can hold a pitch, writes her own stuff and darn it, she is cute and peppy. I'm not even part of the overall fan base and I recognize those characteristics as being crucial to fame. If she is laying in an alley shooting up heroin with a Jihadist, it's news to me - and I like that, too. I don't want too much reality with my music icons (George Michael, Justin Bieber, Jerry Lee Lewis, Axel Rose, Tommy Lee...just so you know). DISCLAIMER: I am not now nor have I ever advocated laying in an alley and shooting up heroin with a Jihadist. Honestly; I'd find that counterproductive and a real career killer. Taylor Swift is young, beautiful, talented and rich and laughing all the way to the bank...you've got to expect the haters. Rationalizations for this hate is all over the internet. If someone is genuinely put off by her existence, I propose the appropriate action is silence and of course, don't buy the merch. Boom. Good comeback, public. Holy cow, I was 30 before she was born. I'm no expert on Taylor Swift music, but I do love this song. Not a hater; hate the hating. Agree wholeheartedly. Cute kid. Skilled and talented. I doubt any promoter will lose money letting her sing what she wants. Have a good day, Geo. Sorry, dear friend. I needed to take care of some business before I wrote my comment. I'm AGAINST it! I'm AGAINST it, I tell ya! Why doesn't he get a haircut? You can't even tell if he's a boy or a girl. What? What? Mrs. Shady just poked me in the ribs and told me Taylor Swift is a girl. Okay but that doesn't mean I like her music, cuz I DON'T! Who needs this newfangled synthesized baby food they call music? Why, back in my day, we had good music played by great bands like Rotting Corpse, Abracadaver and Chainsaw Love Affair, and today there are still some bands around that are keeping the spirit alive such as Cherdo & the Flipsides, Janie Junebug & the Cockroaches and Shady Del Knight & the Rats. Buy THEIR records! Go to THEIR shows! Throw your undies at THEM! How could you forget about The Besties World Tour? If I throw my undies at them, the whole band might suffocate...and I'll get a chill. So, it's back to the giant sign professing my undying affection. Keep it weird, Shady - I can't do it alone! 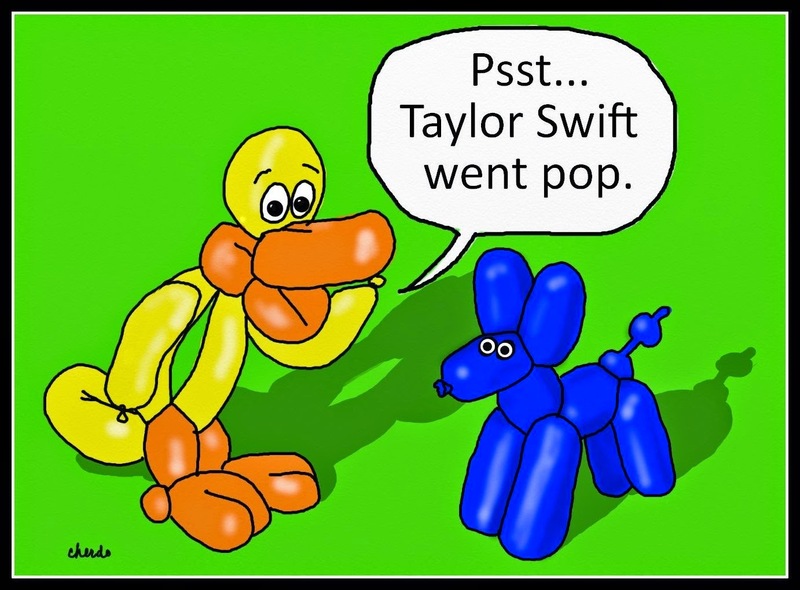 NEWSFLASH: Hubzam knows who Taylor Swift is! He just shoulder surfed and said, "That's Taylor Swift? Where's her great big red lips?" This is significant. He doesn't recognize most of our acquaintances on a normal day... She must be awesome and powerful. This is now the second time in two weeks that I've heard the name Taylor Swift. I don't know a thing about Taylor Swift other than the facts that she don't do Spotify and she don't do what she used to do and should stop doing what she's doing and do what she used to do again (according to the haters, I guess). HEY YOU KIDS! WHY DON'T YOU GO TO THE PARK AND PLAY?!!! ...Sorry. Now where was I? Oh, hell, I've lost my train of thought. I must have left it in the Club Car while drinking rum and Karma-Kola. That train might have jumped the track anyhow - it's good you got off. Karma-Kola? KARMA-KOLA? Don't drink and ride. Maybe she'll just be fine and rich. Wouldn't that tick 'em off? I've seen the name Taylor Swift many times and wondered what it meant. Now, thanks to you, I listened to her sing a couple of notes. The word for her voice and appearance is "wispy." I appreciate the introduction to Taylor. Now, when I see her name, instead of wondering what that means, I'll think, Move along now. Nothing to see here. Oh, I also don't know what Spotify means. I'm quite hopeless. Living in our own world is not a bad thing. After all, we have our OWN world...what's not to like? This is only meaningful to those who are fans of her country music. I thought her country music was pop, too. There's a lot of that going around. Yeah, honestly, there hasn't been much real Country music since Glen Campbell recorded 'Rhinestone Cowboy' and Kenny Rogers got liposuction (followed by plastic surgery some years later). And needless to say, "real men" don't get liposuction and plastic surgery. It ain't my world anymore, I'm just writ(h)ing in it. How many bluegrass musicians does it take to change a light bulb? 4 - one to change the bulb and three to complain about it going electric. How many hippies does it take to change a light bulb? None - they let it burn out, then follow it around for the next 30 years. "Let it go". Best advice I've ever received. And it just keeps giving! Thanks for the reminder!